These light & fluffy lemon & blueberry cornmeal muffins are absolutely bursting with lemon flavour & stuffed full of plump blueberries. I love blueberries and I love lemon and as I have a plentiful supply of both I decided to make some Lemon & Blueberry Cornmeal Muffins. You guys, the result was amazing! I have eaten a lot of muffins in my time and these are by far the lemoniest muffins I have ever tasted. They are totally delicious and have just the right amount of sugar to balance the sharpness of the lemon. The plump little blueberries have their part to play in this too and work perfectly with the zingy citrus flavour. And the slight graininess of the cornmeal lends a delicious texture to the tender sponge and soft fruit. You guys just have to make these! I would love to know what you think of my Lemon & Blueberry Cornmeal Muffins so please let me know in the comments below. I would also love to see your pictures. Tag me on Instagram @avirtualvegan and add the hashtag #avirtualvegan so I don’t miss it! If you love blueberries then be sure to check out my Blueberry Sauce with Lavender and my Blueberry Breakfast Bites. 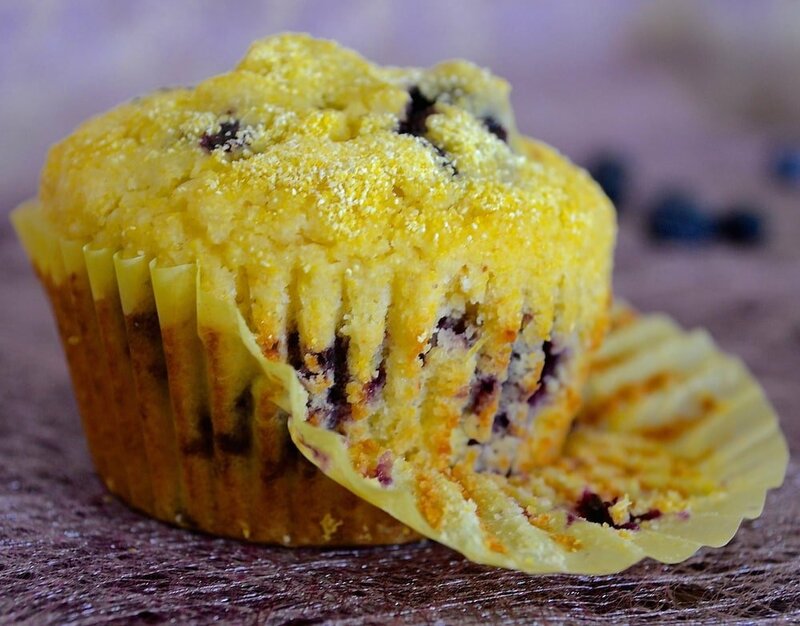 These light and fluffy lemon & blueberry cornmeal muffins are absolutely bursting with lemon flavour and stuffed full of plump, sweet blueberries. 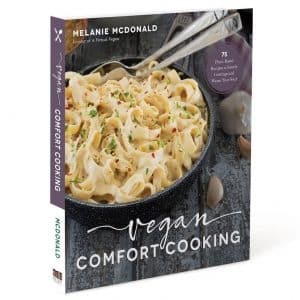 The addition of cornmeal lends a delicious texture to the tender sponge and soft fruit. 187g | 1.5 cups all purpose flour or cake flour, (In the UK use plain flour). Take 2 tablespoons of flour from your measured 1.5 cups and sprinkle it over the blueberries then stir them well so that they are coated in the flour. Set aside. Make sure your oven is at temperature and your muffin pans are lined before you mix the wet with the dry as you will now need to work quickly. Pour the wet ingredients into the dry ingredients and mix only just enough to incorporate the flour. Do not over mix or beat the mixture! You will start to see the mixture bubble a bit which is why you need to move quickly to get them in the oven. As soon as you can no longer see any bits of flour pour in the blueberries and any remaining flour in the bottom of the bowl they were in. Fill your muffin cases evenly and sprinkle some cornmeal on the top of each one. 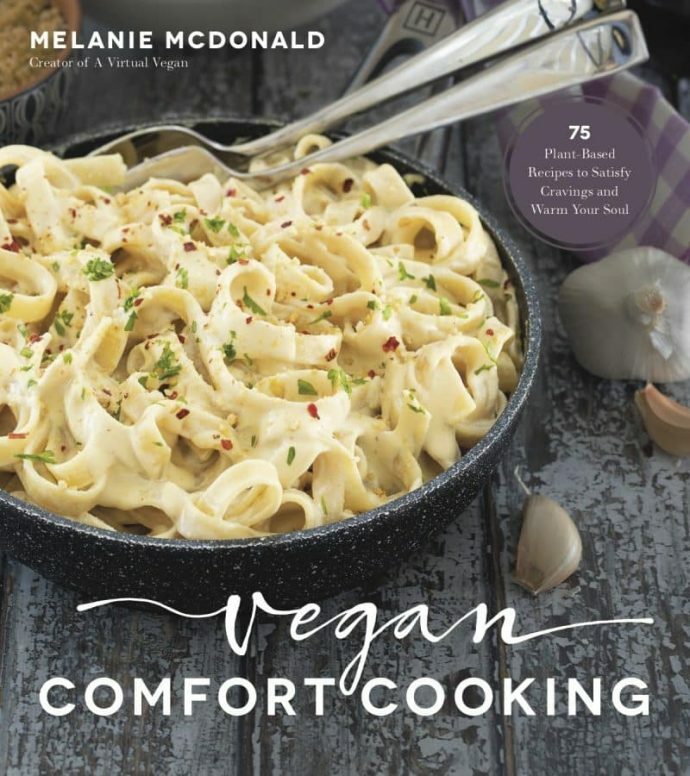 Get them in the oven as quickly as you can. Bake at 400°F for 20 minutes or until a toothpick or skewer when inserted into one of the muffins comes out clean. Hi Kendall, I’m glad you enjoyed my Lemon & Blueberry Muffins. Can I recommend silicone muffin liners? They are amazing and nothing ever sticks to them and you just wash and reuse them again and again. You can pick them up in kitchen supply stores or Amazon sell them. Probably eBay too. I wanted these muffins to be pretty low fat so they only have a little bit of coconut oil in them. Unfortunately when you reduce the fat they do sometimes stick a little more than full fat ones would! Thanks Priya! That’s great!!! ???? This muffin looks delicious. I can’t resist a good blueberry muffin. Thank you for sharing this at the Home Matters Party! Awesome! We make corn muffins often and I’m totally up for this change! Who could not be when blueberries are involved!! ???? I love cornbread, I love muffins and I love lemon, so these look really delicious! I’m guessing these are just an extra yummy cornbread type muffin! Sounds divine! Thank you! They are actually much lighter than cornbread generally is. More of a traditional light sponge texture. You had me at “full of lemony zinginess”. These look fantastic! Thanks Madiha! I hope you enjoy them! Yum! 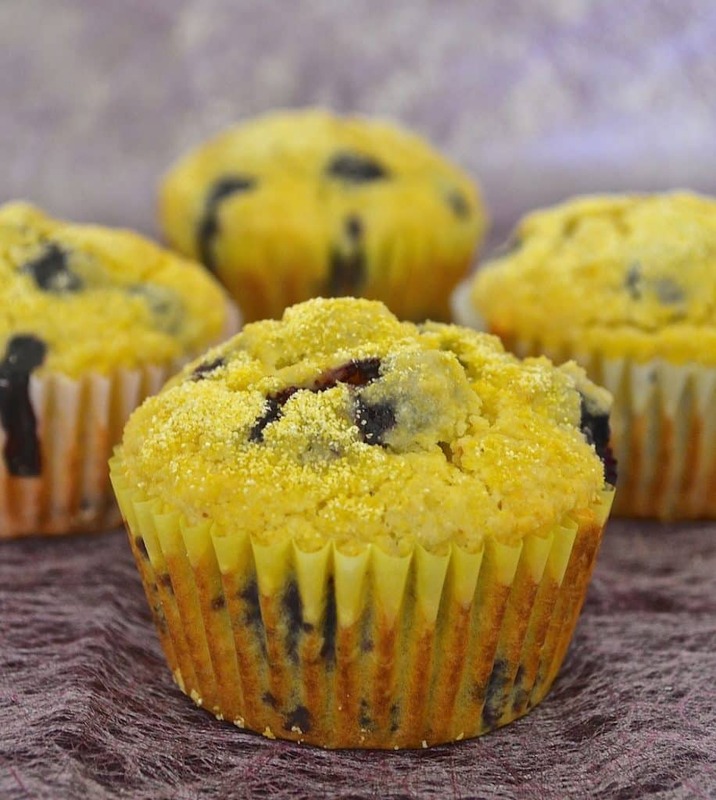 I have Blueberry Lemon Cornmeal Muffin recipe on my blog, too. Similar to this one, but still different. Great minds think alike! So you do! Just checked them out and they look great. They are probably a little healthier than mine too as I’ve use white flour and you don’t. I rarely use white flour in my baking but couldn’t seem to get the texture or flavour that I wanted with wholewheat or spelt. A little indulgence every now and again does no harm though! Lemon-blueberry anything always has my vote! Never tried it with a cornmeal muffin before, but it sounds like a winner. Love it! Yesss! Im all about putting blueberries in corn muffins. The combo just goes so wonderfully together. Thanks for sharing these tasty little muffins! Thanks Justine. Lemon and blueberries just scream summer don’t they? I hope you enjoy them! yum! 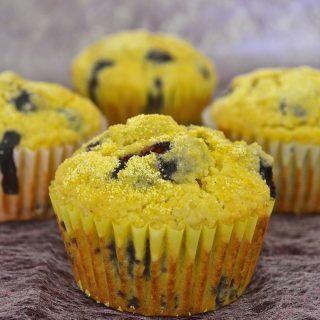 I love lemon & blueberry together and the cornmeal sounds like a hearty, flavourful addition :) definitely pinning this! Lemons and blueberries are certainly the perfect pairing! I hope you enjoy them! My taste buds are dancing at the thought of all that lemony goodness! Thank you for sharing your beautiful recipe. 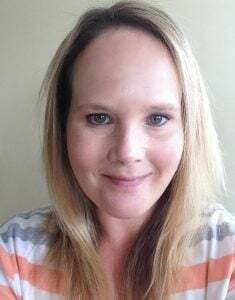 Thank you Kathryn and you are welcome!